North Missouri turkey hunting is about corn or soybean fields providing preferred food through winter into early spring. More so than else where. Many turkey hunters are attracted to big woods. Common to south Missouri. While others prefer more open crop terrain of north Missouri. North Missouri turkey hunting is over rolling hills interspersed by cropland having more food than cover acreage. Winter waste grain carrying over fat reserves. Spring sprouts tender grazing. Bugs soon follow in greater densities due to more broad leaf weeds more common to north over south Missouri. It all adds up to more turkeys. Plus a beauty of north Missouri is you can see turkeys you are working. But a downfall is they can see hunters as well. Turkeys in spring seem to roam pastures and crop fields. Along with surrounding creeks, rivers, small timber lots, common to north Missouri. These areas can easily be glassed from a distance. This allows hunters to follow flocks over a long period of time. An easy approach to observe their patterns. At least 45% – 55% of north Missouri is in agriculture. Fields which have not been cultivated generally grow short green weeds with grain sprouts. These really attract turkeys to feed. Especially fields not visible from roads. Spring turkey season is a time of year farmers work their fields to plant their crops. 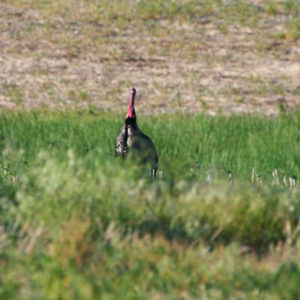 Food sources for turkeys can change overnight if a field is worked or planted. So this is an obstacle turkey hunters must be aware of while hunting cropland. Just like green sprouts in the stubble fields, the turkeys also find short green pastures that were grazed in the winter by cattle or burned good grazing. Different terrain to any big woods hunters seeking oak trees. Once a flock is located, they may be easy to follow. But hunters have to keep his distance. Turkeys can spot movement from a long distance across open fairly flat fields. And do so faster than human eyes can spot any turkey. 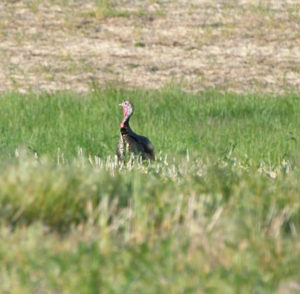 Unlike timbered regions of south Missouri where locations of a gobble is often a mystery, a north Missouri turkey gobble is often in eyesight. This gives hunters an advantage of watching a tom which responds to a call. If a hunter sees a tom, makes a call and the turkey doesn’t respond, a hunter is able to change calls until a reluctant tom responds. He then is able to continue until it works in the hunter’s direction. If an old boy moves on, that hunter is able to keep his eye on “his” tom and either cut him off or relocate. This is an advantage lost in timber hunting. Sneaking beneath creek, river banks is a very effective way for anyone to move or relocate in north Missouri. If a someone likes to wait it out all day there are many narrow funnels that come together for a blind to sit, wait. CRP land is limited in north Missouri. It typically lays on hill ground that was once in cropland. Hens readily lay their nests in CRP grass. Toms follow these hens to nesting grass where they sit on their eggs. Grass is much thicker than it appears from a road. This is very good all around habitat for any eastern turkey. A majority of folks are attracted to large acreage because they like to move to have a variety of options. MAHA has hundreds of small farms from 80 – 160 acre range which are overlooked year after year. Dozens of these small tracts of land in north Missouri don’t ever see a spring turkey hunter. 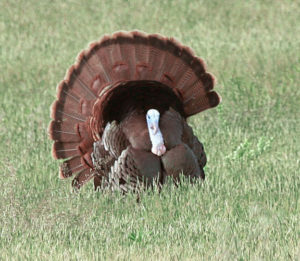 If you are looking for a quality hunt in one of the nation’s top producing states, try north Missouri turkey hunting. It should also be a precursor to a fall deer hunt.